The Poker TDA is a voluntary trade association of the poker tournament industry. The Association is dedicated to adopting a uniform set of poker tournament rules worldwide. The Poker Tournament Directors Association (TDA) held it’s sixth TDA Summit on June 26-27, 2013. Over 160 TDs from all over the world gathered to review the rules and vote on changes and additions. After two days of intensive discussion, 9 new rules were adopted, and clarifications were made to 25 of the current rules. “TDA Summit VI was the most productive since Summit I in 2001”, commented Founding TDA Board Member Dave Lamb. His fellow Director Matt Savage attributed the success of Summit VI to: “…the members and volunteers who attended and especially to the new directors: Jack Effel, Tab Duchateau, and Neil Johnson, who literally bring a world of experience to the TDA”. 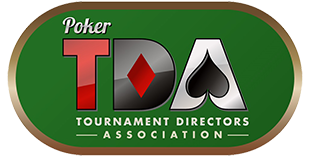 Version 1.1 of the 2013 Poker TDA Rules were released August 11th. For complete video coverage of TDA Summit VI, courtesy of professional poker videographer Rob Perelman (VeeRob.com), click here. For pictures, articles, comments, and much more coverage, and to post a comment on the Poker TDA Forum, please click here. The Poker TDA is an open-source, non-aligned, voluntary organization. Unless expressly prohibited, TDA Rules may be used in whole or part provided this statement is prominent on the same printed or online page with the copied rules: "TDA rules used by permission of the Poker TDA, Copyright 2019, http://www.pokertda.com, All rights reserved." If online, the TDA website link must be live.